Many years ago, I scribbled the following recipe (and subsequently altered it somewhat) from an article about the Schwarzwald in the flight magazine on Air Canada - or was it Canadian Airlines? This Black Forest Cake is far superior to the travesties that are sold commercially. It might look like it's complicated to make, but it's not really hard at all. Oh yes, and the vitamins in the cherries cancel out the cream calories; so it isn't bad for you! Drain the cherries (save the juice) and soak cherries in 5 Tbsp Kirsch OVERNIGHT. Turn oven to 350F & into a bowl sift the dry ingredients. Make 3 holes; pour vanilla, oil, vinegar into the holes. Over that quickly pour LUKEWARM water. Beat well. Pour batter into an 8inch square UNGREASED cake pan or make a double recipe to bake in two 9inch round UNGREASED pans at 350F for 30 minutes. Let cool well on wire racks before assembling cake. Drain cherries. SAVE the Kirsch. Set cherries aside for a moment. In a small pot, combine 2 Tbsp sugar & 2/3 c. cold cherry juice. Bring to a boil, stirring until sugar dissolves. Boil 5 minutes. Remove from heat and cool to lukewarm. Stir in 2 Tbsp Kirsch. Reserve the rest of the Kirsch for the filling and topping. Whip 2 c. cold cream in chilled bowl until peaks form. Slowly beat in 3 Tbsp Kirsch (from the soaked cherries) and 5 Tbsp icing sugar until blended. Prick each cooled cake layer in several places with a fork. Spoon syrup onto cake; let layers rest for 5 minutes to absorb syrup. Put the other cake layer on top. Put more cherries and cream all over top and sides. Leave a few cherries to garnish the top. Put shaved chocolate on sides. Garnish the top of the cake with the extra cherries and ginger mint if you have it. Tip: If you are making a layered cake, it is easier to remove the cakes from the pans if you line the bottom of the pans with parchment paper. We call this eggless cake Patrushka Cake and got the recipe from my sister P's Godmother. However, I have heard that it is sometimes called one pan or wacky cake because it has no eggs and does not require a greased pan: it can be made in the pan it will be cooked in. . . . It makes the best chocolate cake I've ever had. (This cake turns out very well as a gluten-free cake by replacing the wheat flour with rice flour. For more information, please consult Ellen's Kitchen - Flour substitutions and Gluten Free Baking.) Yes, yes, the photo doesn't show the chocolate icing. That topping is whipped cream for Black Forest Cake. But the cake is the same. Sift icing sugar, cocoa powder and salt together. Cream in butter and cream cheese. Add water (or coffee) and vanilla. If the icing is too stiff, add a bit of plain yoghurt. Spread icing on cooled cake. Turn oven to 350F. Sift the dry ingredients into a bowl. Make 3 holes; pour vanilla, melted butter, vinegar into the holes. Over that quickly pour LUKEWARM water. Beat well. Pour batter into an 8inch square UNGREASED cake pan or make a double recipe to bake in two 9inch round UNGREASED pans at 350F for 30 minutes or til a cake tester comes out cleanly. This cake is really moist and really good. I use it when I make Black Forest Cake but it is also excellent with ordinary icing. Some people serve it without any icing at all and haven't received too many complaints. It also makes very good cupcakes. Leave out the cocoa powder to make a very good White Cake. These are arguably the best brownies ever... one of the keys to their success is the use of room-temperature ingredients. This is pretty much exactly the same as "Brownies Cockaigne" in The Joy of Cooking (1975 edition) by Irma S. Rombauer. Turn oven to 350F. 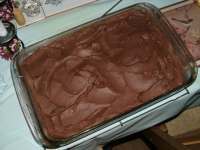 Melt butter and chocolate in a double boiler set over gently simmering water. When melted, set aside to cool. (Ms. Rombauer says that if the chocolate/butter mixture is not allowed to cool, the brownies will end up "heavy and dry"
Butter the pan. Sprinkle lightly with flour - knock it back and forth to distribute the flour evenly over the pan. Set aside. Whisk in sugar (½ cup at a time) and vanilla until the mixture is creamy. Add the flour and gently fold it in until it is almost uniformly coloured. Add the raisins and stir in until the flour is fully mixed into the batter. Pour batter into the 9"x13" rectangular BUTTERED cake panand bake at 350F for 25 minutes or til a cake tester comes out cleanly. Allow to cool completely before cutting.